Tiger sharks are one of the most successful large predators in the world’s oceans, but studying what they eat has been a challenge for researchers. Historically diet is studied through examining stomach contents, but scientists at the Australian Institute of Marine Science (AIMS) and collaborators are leading the way in understanding more about the feeding habits of sharks from their skin tissue. This allows us to learn about shark diet based on a quick non-lethal approach. In a recent study, AIMS marine biologists Dr Luciana Ferreira, Dr Michelle Thums, Dr Mark Meekan and co-authors from a number of Australian universities, revealed their findings after examining the tissue samples of 273 tiger sharks from Western Australia to New South Wales and the Great Barrier Reef. 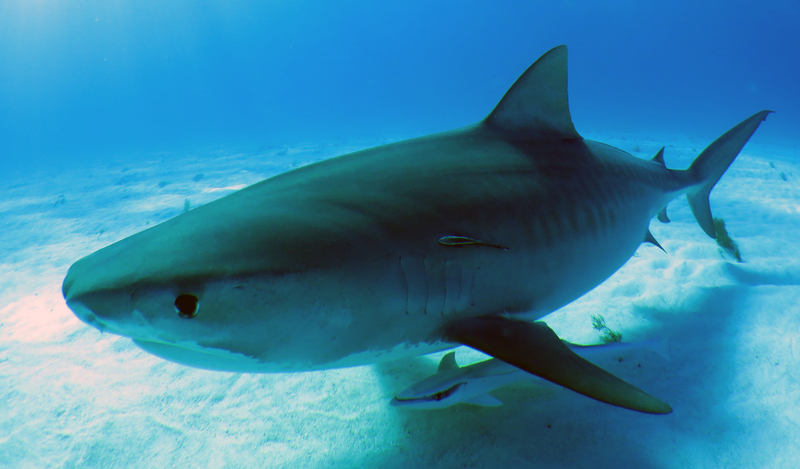 Samples of blood and muscle tissue of tiger sharks showed information on the prey, position of individual sharks in the food chain, and even what type of habitat (coastal or offshore, seabed or open water) the animal had been feeding in. Dr Ferreira said tiger sharks are large mobile animals and to ensure sustainable and resilient populations, we need better data on their feeding and behaviors. “In terms of predators, if we can understand the shark’s motivations and how they are using habitats, we can also understand their function within these habitats,” she said. 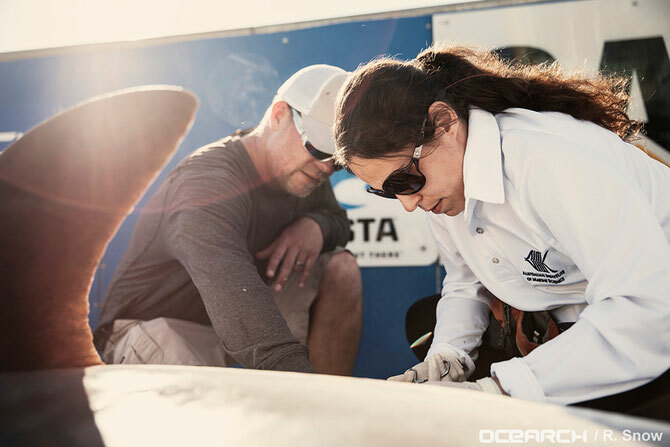 Dr Luciana Ferreira takes small tissue samples from a tiger shark. Image courtesy of Ocearch. 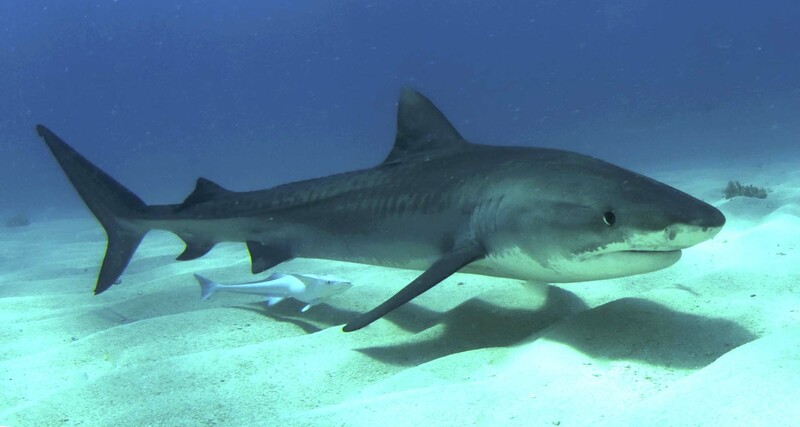 Difficulties involved in the direct observation of feeding behaviour of marine megafauna such as tiger sharks, has led to the use of alternative techniques to provide insights into the process of their foraging. One of the most common of these is the analysis of stable isotopes of carbon and nitrogen in their tissues, which can provide information on diet, feeding position in the food chain and interactions among different species, and their migratory movements. 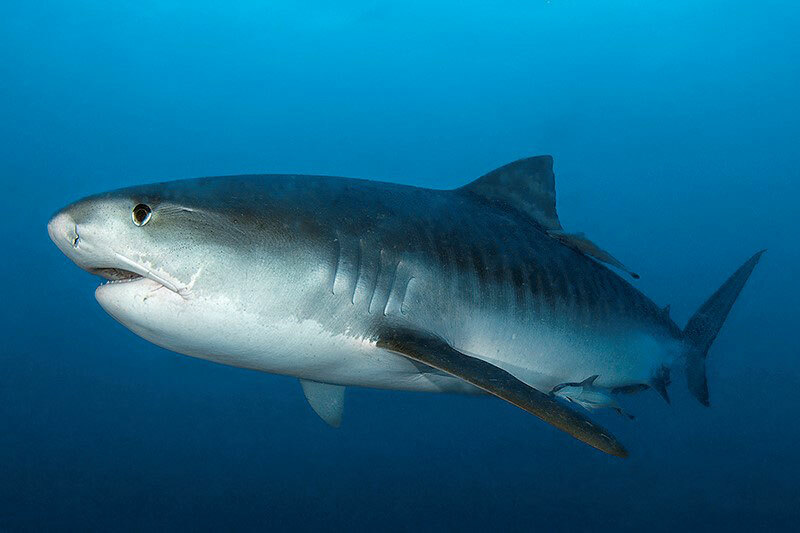 “Our analysis of stable isotopes shows that the functional role of tiger sharks in food-webs varied among different marine habitats we sampled along the tropical and temperate coasts of Australia,” Dr Ferreira said. “Tiger sharks in Shark Bay and Ningaloo Reef in Western Australia, and on the Great Barrier Reef had long-term diets based in seagrass and reef-associated food webs. In these habitats they are focussed on turtles and dugong as prey. “In contrast, when sharks were sampled in more temperate habitats such the waters off New South Wales and southern Queensland, the composition of their tissues reflected a diet based on more pelagic [ocean-going] food webs, and they were focused on large fish. “Tiger sharks occupied roles at the top of food webs at Shark Bay in Western Australia and on the Great Barrier Reef, but not at Ningaloo Reef or off the coast of NSW. “This means the local environment and prey community appear to be the most important determinants of the diet of tiger sharks.” Dr Ferreira said the research confirmed the role of tiger sharks in Australian coastal ecosystems as opportunistic, flexible predators. The research paper ‘The trophic role of a large marine predator, the tiger shark Galeocerdo cuvier’ is published in Nature Scientific Reports. A collaboration between the Australian Institute of Marine Science (AIMS), Flinders University, University of Western Australia, and Southern Cross University documented the industry of four major shark viewing industries across the Australian coast. AIMS marine biologist and co-author of the study Dr Mark Meekan said the research aimed to provide an estimate of the economic value of shark diving tourism across Australia to help inform decisions about how sharks are managed. 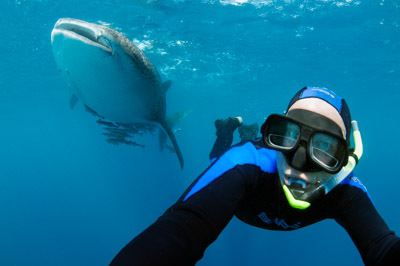 Dr Meekan said whale sharks, known as the gentle giants of the sea, were the most popular drawcard for tourists who spent an estimated $11.6 million for the snorkelling experience. 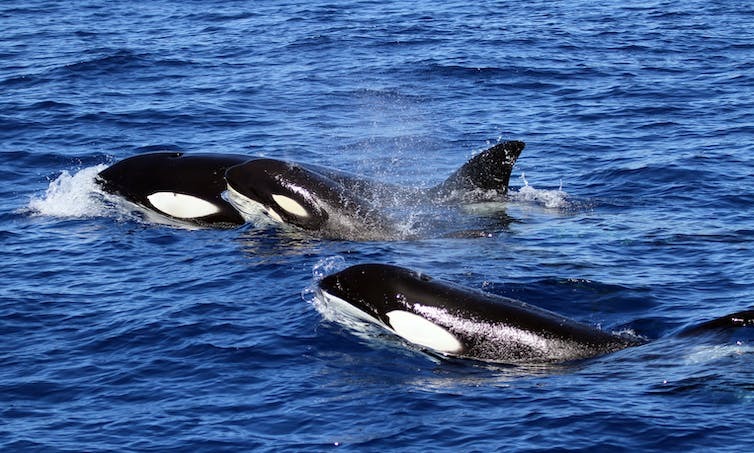 “Ecotourism focused on these animals is now a growing and profitable industry, with a focus that not only uses sharks as a renewable resource, but also engages people in their conservation,” he said. The study surveyed 711 tourist divers over a one year period and documented their expenditure, including accommodation, transport, living costs, and other related activities during divers’ trips. Flinders University Associate Professor Charlie Huveneers, lead author of the study and research leader of the Southern Shark Ecology Group, said the white shark cage-diving industry off Port Lincoln, South Australia, was the second most valuable shark viewing industry contributing $7.8 million in direct costs to the economy in 2013–2014. “On top of costs directly associated with shark viewing, white shark and whale shark tourists spend as much again in additional expenditure in the region,” Assoc Prof Huveneers said. Assoc Prof Huveneers said wildlife tourism was one of the fastest growing sectors of the tourism industry, but the impact to the natural environment must be measured. “This reiterates the importance of adequate management of these industries to ensure sustainable practices, so future generations have the opportunity to view and interact with sharks in the wild in the same way that we currently can,” he said. Dr Meekan said about half the white shark divers were domestic visitors but the highest percentage of domestic tourists were found in the grey nurse shark-diving industry, at 59 per cent. Most tourists in whale shark snorkelling tours were international tourists (55%) and only 29% were Australian. The paper 'The economic value of shark-diving tourism in Australia' has been published in the journal Reviews in Fish Biology and Fisheries. Following on from an AIMS publication in 2012, which described a 27-year decline in coral cover on the Reef, and last year’s update, today’s update shows that average hard coral cover (the most common indicator of reef health) across the entire system declined further during 2016, but the magnitude and trajectory of change varied between the Northern, Central and Southern regions. “The Great Barrier Reef is a large, dynamic and important ecosystem, so it is essential that we continually monitor its condition and trends, and update our understanding of the reef’s current health in a broader context”, says Dr Britta Schaffelke, Program Leader for the AIMS ‘Healthy and Resilient GBR’ Program. Dr Hugh Sweatman, AIMS Research Scientist and head of the monitoring team explains, “Our most recent data show that in the Northern region, coral cover is less than half of what is was in 2011, which is unprecedented for the region in the last 30+ years. “This decline is largely due to severe coral bleaching event that caused significant mortality in 2016, in combination with 2 severe cyclones and continued crown-of-thorns outbreaks. Trends in mean hard coral cover across the Northern, Central and Southern regions of the Great Barrier Reef over the past 32 years. Read the full report for further detail. The Southern GBR region during 2016/2017. 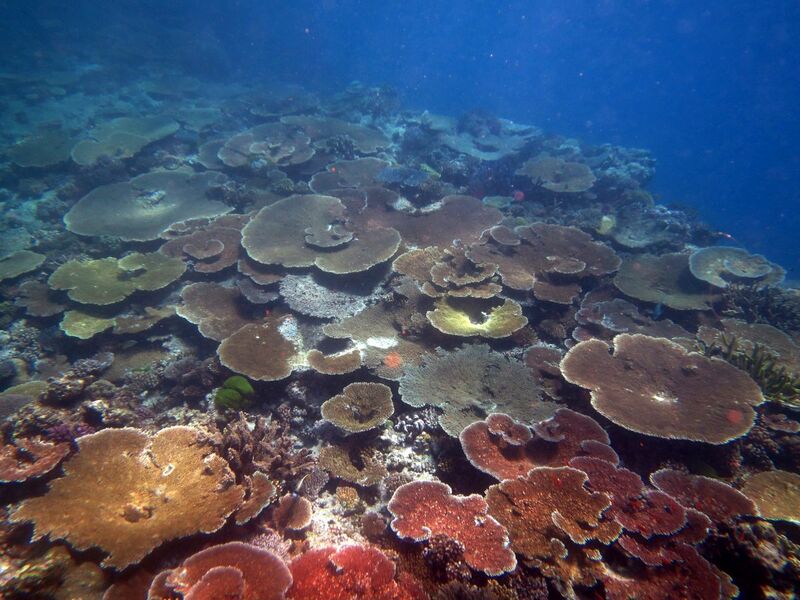 Coral cover on reefs of the Southern GBR has recovered remarkably since it was obliterated by storms in 2008 and then Cyclone Hamish in 2009. The reef slopes of Lady Musgrave Reef and Erskine Reef, pictured here, are now covered in tabulate and branching Acropora sp. corals. The update includes information taken from the extensive surveys taken over 2016 and into early 2017, but does not include data after the 2017 severe bleaching event, or Tropical Cyclone Debbie. This information will be included in future updates. 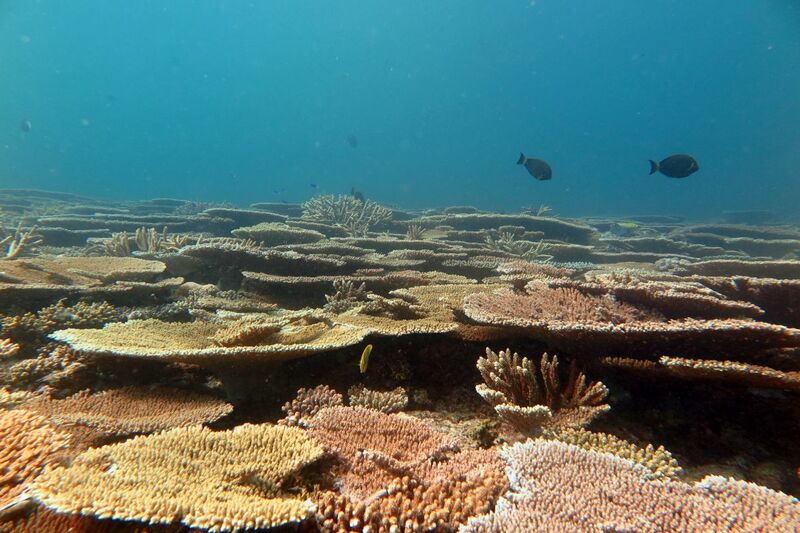 The researchers highlight that it is difficult to predict the recovery of the Great Barrier Reef. “Despite the fact that we have over 30 years of information from the Program, we are only now starting to have data gathered over a sufficiently long period of time to allow us to understand the reef recovery process under a changing climate,” says Dr Schaffelke. 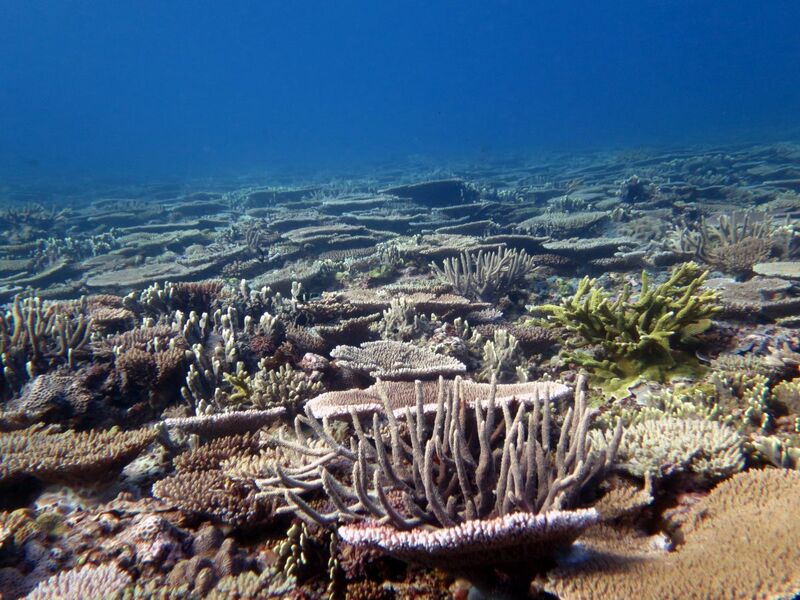 A recent AIMS study indicated that recovery after a major heat-stress event in 2002 on the GBR was slowed, compared to previous recovery periods, and that affected reefs suffered high rates of coral disease. 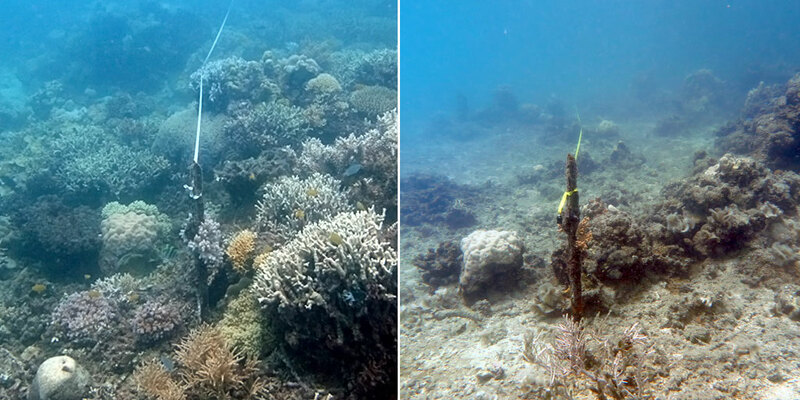 A separate AIMS study on the effects of cyclones concluded that, while recovery can be strong on some reefs, the projected increases in intensity of cyclones as a result of climate change could make it more difficult for reefs to recuperate. AIMS’ Long-term Monitoring Program is the longest, most comprehensive source of information on the health of corals for the Great Barrier Reef. 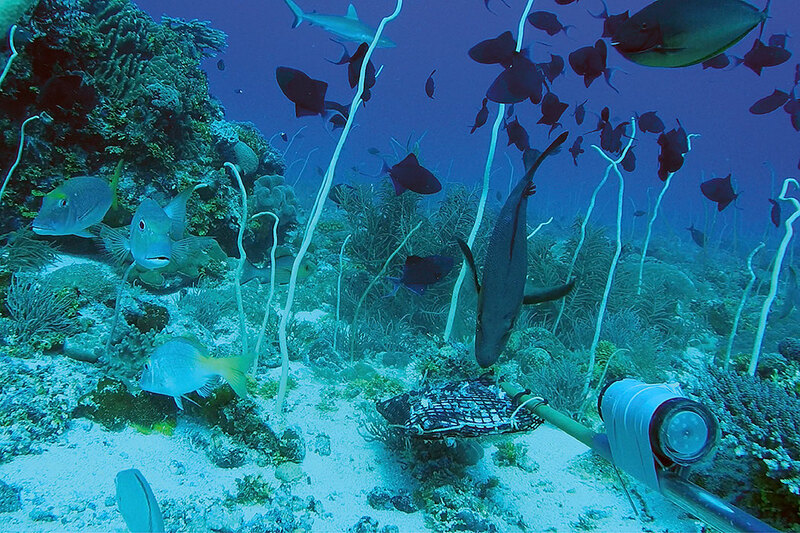 These goals come together with coral health monitoring. Divers, snorkelers or people walking around reef areas during low tides can send us crucial information about coral bleaching, helping us to build detailed pictures of the health of different reefs. Participants can use a colour chart, backed up through the CoralWatch app or website, to measure accurately the colour and type of coral they see. 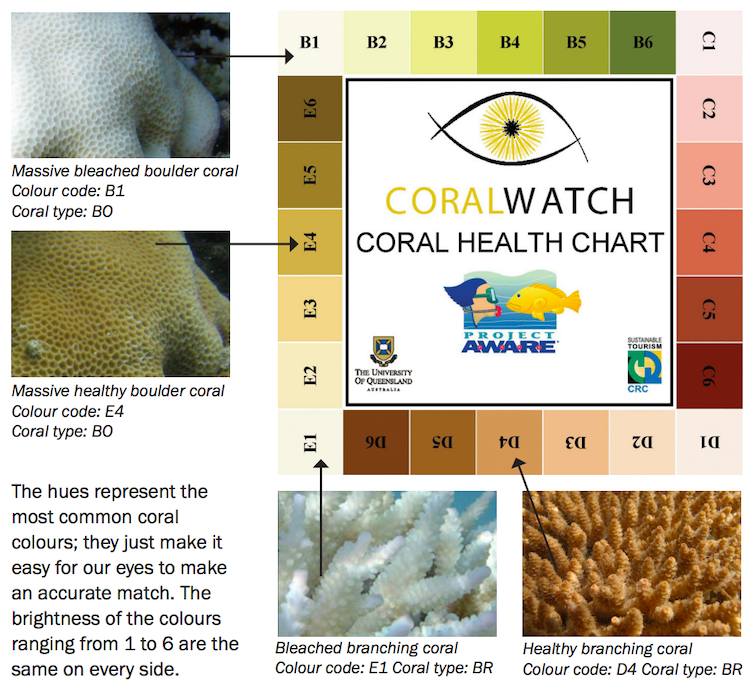 The chart covers 75% of known corals, and can be used with no prior training. We also ask people to enter the type of coral (branching, boulder, plate or soft), the location, and the weather. This allows scientists to identify the location and extent of any problems quickly (and is an excellent way to learn more about our reefs). In fact, you don’t even have to go to a reef to participate and discover through CoralWatch; we have classroom and virtual reef systems, and just talking the problem through can help. 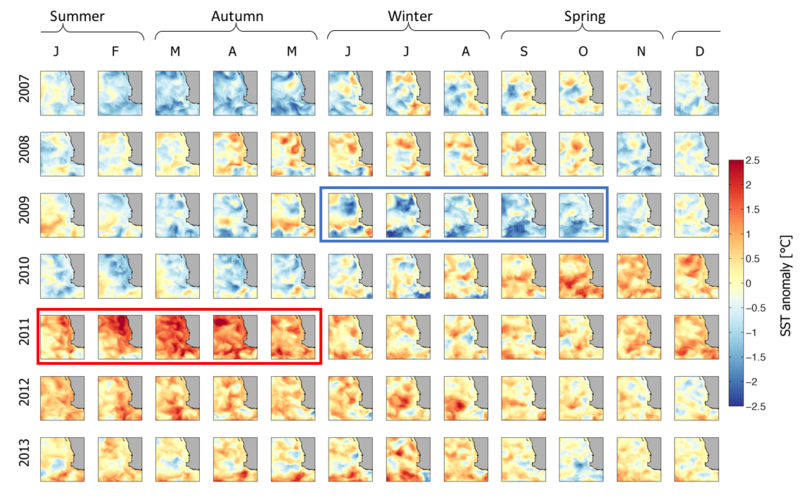 The graphs shown below are samples of CoralWatch data from the northern and southern reef during 2016’s catastrophic mass bleaching event, while the pair of graphs further down the page show data from just a few days ago at Lady Elliot Island and the very remote North Mariana Islands in the West pacific. The results for the North Mariana Islands, from a CoralWatch survey conducted last week, shows mid-level coral bleaching and demonstrates that even very remote reefs are not climate-proof. Australians increasingly believe the government needs to act on climate change, and some of this change in opinion is likely fuelled by continued reports of coral bleaching. The north-west oceanic shoals - natural banks that rise from the seabed, in this case from depths of 200 m up to within 15─50 m of the surface - were found to support the highest fish diversity reported globally for deeper ‘mesophotic’ or middle light level coral reefs (20─80 metre depth) and may support the resilience of shallower coral reef communities. The study of nine oceanic shoals in the Timor Sea was led by the Australian Institute of Marine Science (AIMS) and reported recently in Coral Reefs. The relatively clear waters in the study region allow fauna such as hard corals and macroalgae to grow in depths of up to 60─70 m, supporting diversity similar to shallow reef systems. The fishes may also benefit from enhanced productivity driven by local upwelling and interacting currents. “Characterising these deeper coral-reef communities is critical because mesophotic reefs may provide a unique contribution to biodiversity as well as potentially enhancing the connectivity and resilience of surrounding shallow reefs,” Dr Moore says. While progress has been made understanding the connectivity within and between coral reefs, the degree of connectivity between shallow and deep coral reef populations is largely unknown. Deeper reefs may act as important refugia, providing a source of larvae, juveniles or adults, to replenish more exposed shallow-water reefs after impacts such as coral bleaching, storms and cyclones, fishing pressure and warming events. This is especially important to understand in regions such as north-western Australia, which is experiencing increasing pressures from human activities such as fishing and petroleum industries. 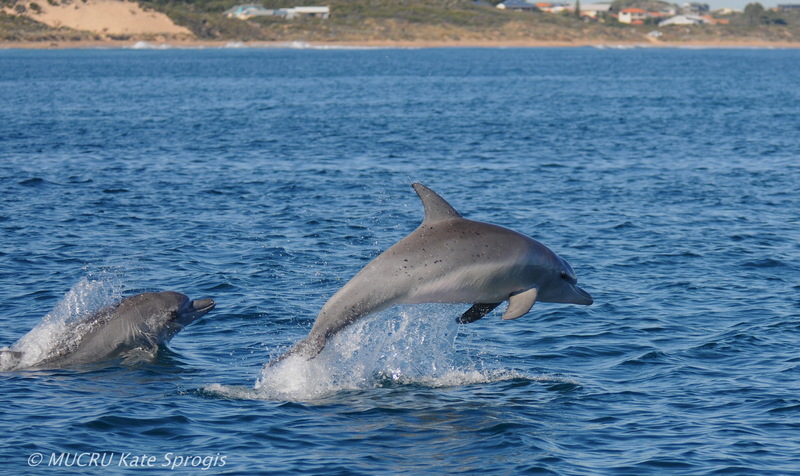 The north-west oceanic shoals are of conservation interest at both a regional and global scale. They support many species of conservation interest including the humphead wrasse, greater hammerhead and various sharks, rays and groupers. Australia’s north-west is one of the country’s most economically significant marine regions, producing most of Australia’s domestic and exported oil and gas. It also has high-value ecological habitats supporting a range of protected species such as dugong, turtle and whale sharks. 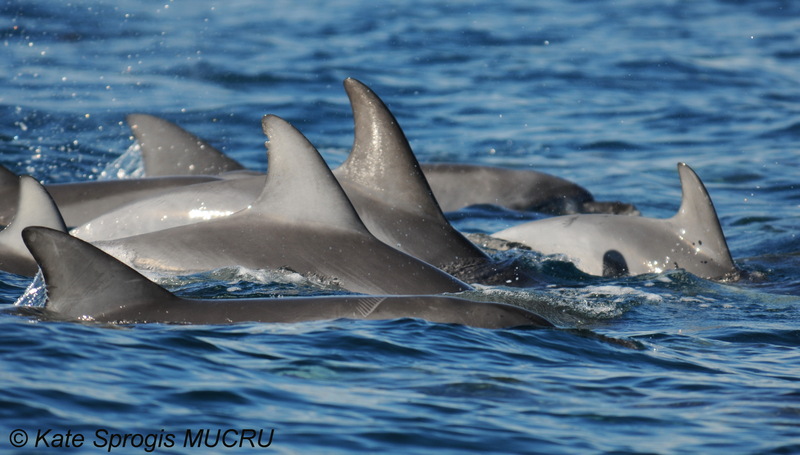 The need for baseline ecological data for this region was highlighted by the 2009 uncontrolled release from the Montara wellhead platform, which triggered monitoring of key ecological communities to ensure the protection and sustainable management of natural and economic values into the future. 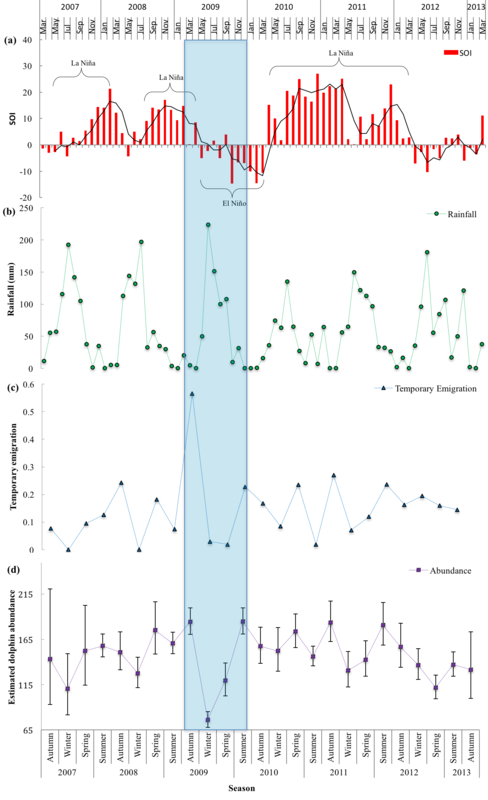 Research published today in Global Change Biology investigated whether predicted increases in cyclone intensity might change the nature of coral reefs. AIMS scientists used the world’s largest coral reef ecosystem, the Great Barrier Reef, as a test case to understand what lies ahead for coral reefs. A team of researchers led by AIMS scientist, Alistair Cheal, first assessed the ecological impacts to the Reef from cyclones, based on multiple data sets collected from the region. The Institute’s Long-term Monitoring Program contributed crucial broad-scale field data from as far back as 1996, including data captured after recent severe cyclone events (Hamish in 2009, Yasi in 2011 and Ita in 2014). “Here at AIMS, we have been closely monitoring reefs along the Great Barrier Reef for over 20 years through the Long-term Monitoring Program. 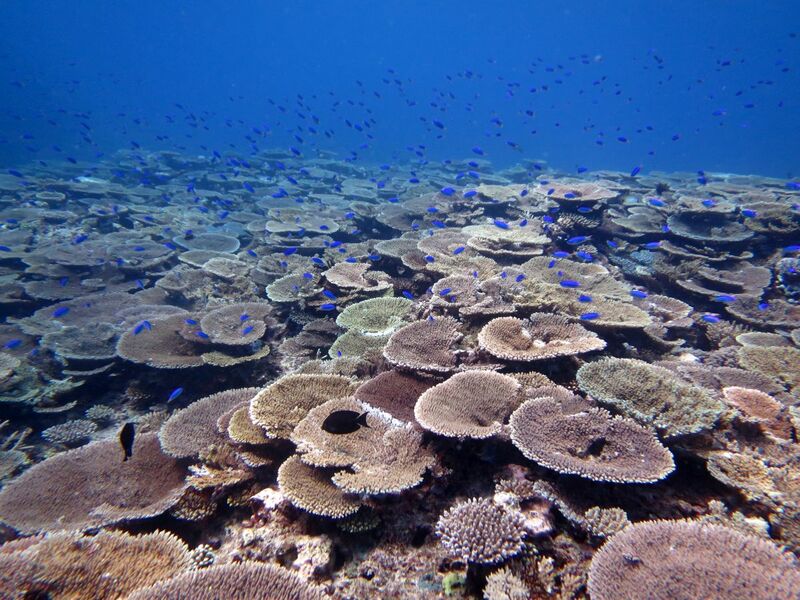 An analysis of the data collected from outer reefs indicates that a recent spate of unusually intense cyclones caused record destruction of corals and great loss of fishes over >1000 km,” stated Mr Cheal, the study’s lead author. Using modelling tools, the data was then contextualised in terms of future climate-driven threats based on published predictions for increasing cyclone intensity. The scenarios yielded grim consequences for reefs. “What we found was that the return time of cyclone sequences likely to cause extreme and widespread losses of corals and fishes could increase from hundreds of years, to once every 25 years within this century. This presents a real threat to the status and recovery of coral reef ecosystems,” Mr Cheal concluded. The implications extend beyond the projected coral and fish losses through associated decreases in biodiversity, increased vulnerability of coral reefs to long-term degradation and associated flow-on effects to social and economic services. 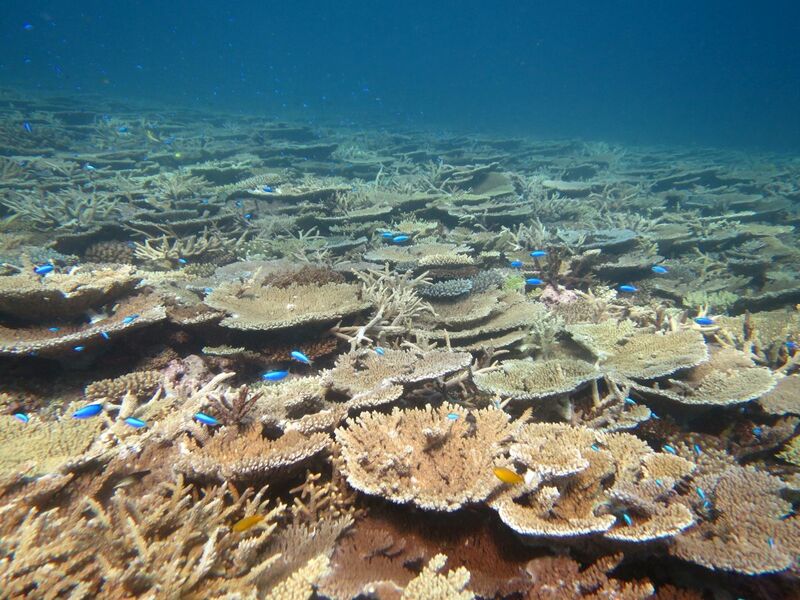 The paper: “The threat to coral reefs from more intense cyclones under climate change” by Alistair J. Cheal, M. Aaron MacNeil, Michael J. Emslie and Hugh Sweatman is available online today. If the thought of going into the ocean this summer fills you with trepidation, here are five things you can do to reduce your risk of encountering a shark. 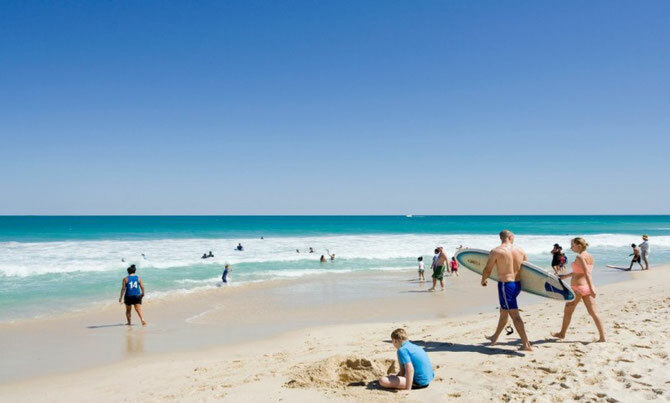 A WA Department of Fisheries report found that of the 26 shark attacks in the State between 1991 and September 2011, only one was within 30m of the shore. Two-thirds of the attacks were more than 200m offshore, and SCUBA divers and snorkelers made up almost half of shark attack victims. Only three of the attacks were on swimmers. White sharks prefer cooler waters and two-thirds of the attacks in WA in the 20 years to 2011 occurred in water temperatures below 200C. Only one was in waters above 220C. This preference for cooler water plays out in statistics showing there is a higher rate of attacks off the southern half of the WA coast. More attacks also happen in winter and spring rather than summer and autumn, despite more people being in the water in warmer weather. And by shallows, we mean where the water is less than 5m deep. More than this and your risk of running into a shark increases. For a long time, the jury was out on these electronic shark repellents but UWA-led research has delivered a result that will be music to ocean lovers’ ears—Shark Shields do help to repel white sharks. 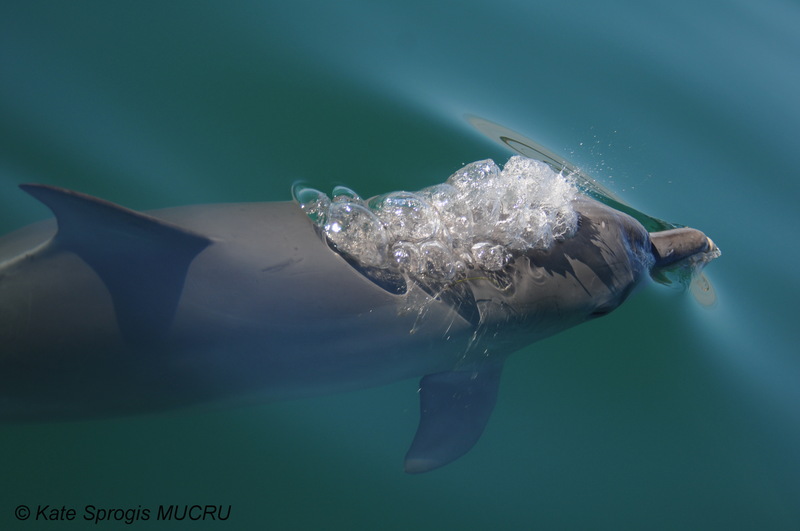 The study found the Shark Shield produced an effective deterrent field of about 1.3m from the devices electrodes. Shark Shields prevented sharks interacting with a bait 10 out of 10 times on an animal’s first approach, and nine out of 10 times on the second approach. With models starting at $600 a pop, the device is not for everyone. But for divers and others with good reason to ignore the first three avoidance strategies, a Shark Shield might be worth considering. Finally, the Fisheries research was unable to rule out proximity to seal and sea lion colonies as a factor in shark attacks. While the majority of attacks occurred more than 10km from a colony, the study found this may reflect relatively low levels of human activity in these areas. It concluded it remains plausible that there is an increased risk of attack near seal and sea lion colonies.